Top suppliers year to date, all with gains, were Australia, Qatar, Malaysia, Indonesia and Nigeria. Imports from the US were 202,000, down 74%, the US one of only three sources imports from which declined. Supplies from the US were impacted by the 10% duty China imposed on September 24, 2018. Intense trade negotiations between China and the US may be nearing completion, with some indications that an agreement may be reached before June. China’s demand for LNG is expected to climb as the country continues to move away from coal. In 2018 China imported 53.9 million tons of LNG, up 41%. 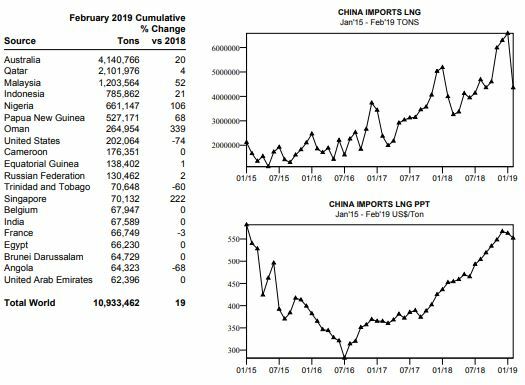 The slowdown early each year with Chinese New Year, the date of which varies from late January to about mid-February, plus declining winter demand, is visible in the graph of China’s imports of LNG over the last several years. From International Trader Publications’ LNG World Trade Report, a continuously updated report analyzing global LNG trade.